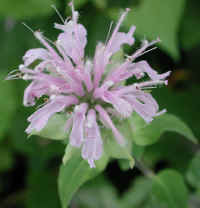 (Bergamot, Wild (Monarda fistulosa) - 01) Wild bergamot is a member of the Mint Family (Labiatae) and is one of the twelve United States species of tall mints commonly classified as Beebalms, but it is not the same as actual Beebalm (M. didyma). Wild bergamot can grow to heights of five feet, as the ones in this photo. (Bergamot, Wild (Monarda fistulosa) - 01a) This is a closer look at part of this patch of wild bergamot. The white blotches on some of the leaves were caused by road dust and rain drops. 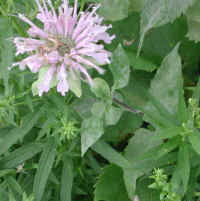 Wild bergamot bloom in July and August. 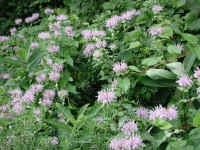 (Bergamot, Wild (Monarda fistulosa) - 02) This is another view of a patch of wild bergamot. Because of the height of these wild bergamot, to take this photo, I had to hold the camera high over my head and aim the lens slightly downward. This is the first time we've seen wild bergamot at Sleepy Hollow in our more than 24 years of living here. 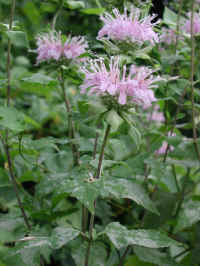 (Bergamot, Wild (Monarda fistulosa) - 03) The leaves of the wild bergamot are lanceolate and toothed and grow opposite one another along the entire stem. The central flowers on the terminal head of this wild bergamot are missing, which we have found to be quite common. 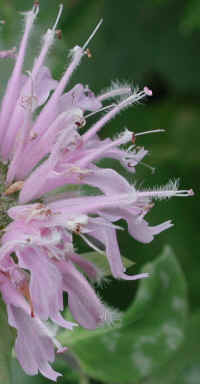 (Bergamot, Wild (Monarda fistulosa) - 04) The many wild bergamot flowers that are contained in the terminal head can vary in length from 1/2 to 1 inch. 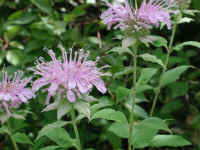 (Bergamot, Wild (Monarda fistulosa) - 05) The flowers of the wild bergamot are irregular with a two-lipped corolla. The upper lip usually stands erect and is hairy and toothed. The lower lip is spreading and has three lobes with hairs on the underside. 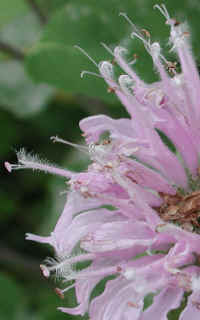 Each wild bergamot flower has two stamens, and one pistil with a two-lobed style. (Bergamot, Wild (Monarda fistulosa) - 06) In this close-up of some of the wild bergamot flowers, we can see how they vary in length (note the two near the center of the photo). 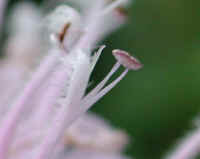 We can also see the way the pistil's style splits into two lobes before connecting to the stigma. (Bergamot, Wild (Monarda fistulosa) - 06a) This is another close-up of some of the wild bergamot flowers. (Bergamot, Wild (Monarda fistulosa) - 07) In this photo we have another view of the way the leaves of the wild bergamot grow opposite one another along the stem. 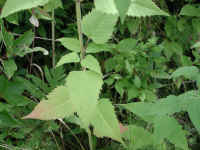 We have also noticed that some of the leaves have what appears to be a small pair of leaflets growing next to the stem. (Bergamot, Wild (Monarda fistulosa) - 08) In this side view of the wild bergamot, we can get a good sense of the structure of the stems, leaves, and flower heads. (Bergamot, Wild (Monarda fistulosa) - 09) By looking at the new flower head of the wild bergamot, we can see that the top flowers are in bud, indicating that the center of the head should have flowers, unlike most of those we photographed. 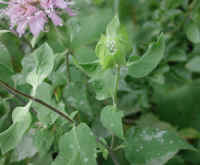 (Bergamot, Wild (Monarda fistulosa) - 09a) This is a close up look at the emerging flower buds of the wild bergamot. 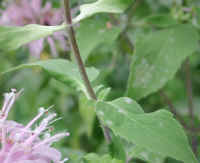 (Bergamot, Wild (Monarda fistulosa) - 10) This is a bee's eye view of the hairy upper lip of a wild bergamot flower. 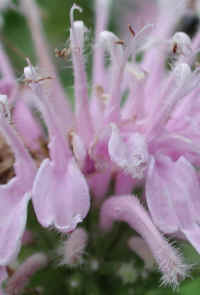 (Bergamot, Wild (Monarda fistulosa) - 11) This is another close-up of a few of the wild bergamot flowers. 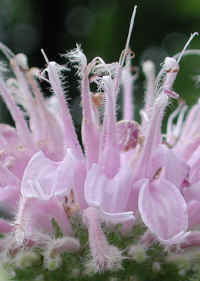 (Bergamot, Wild (Monarda fistulosa) - 12) This is another side view of a wild bergamot flower head. 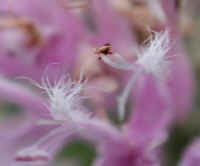 The flower colors can vary from pink to lavender, but the flower is classified in the pink category. (Bergamot, Wild (Monarda fistulosa) - 12a) This is a closer look at a few of the wild bergamot flowers. 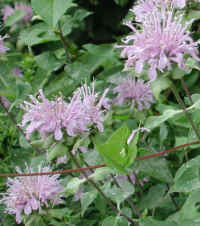 Wild bergamot is a native North American wildflower. 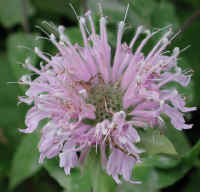 (Bergamot, Wild (Monarda fistulosa) - 13) This is another view of a wild bergamot flower head with its many flowers. 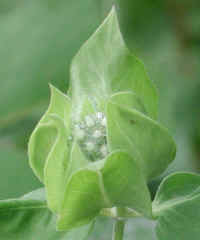 The total width of the flower head is about 2 inches across. (Bergamot, Wild (Monarda fistulosa) - 14) This is a bee's eye view of a wild bergamot pistil with its two-lobed style. 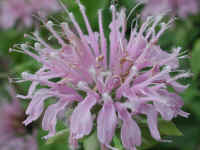 (Bergamot, Wild (Monarda fistulosa) - 15) The flowers on this wild bergamot head are beginning to fade. (Bergamot, Wild (Monarda fistulosa) - 16) The flowers on the head of this wild bergamot have just begun to open. 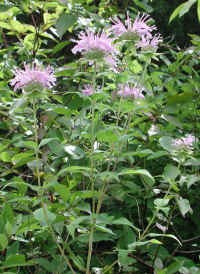 (Bergamot, Wild (Monarda fistulosa) - 17) This is another small patch of wild bergamot. (Bergamot, Wild (Monarda fistulosa) - 18) Some of the wild bergamot leaves have a reddish tint on their tips. 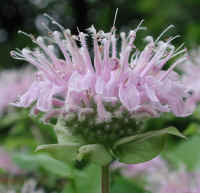 Wild bergamot has only a mild fragrance in the flowers, but the aroma from the crushed leaves is quite distinctive. 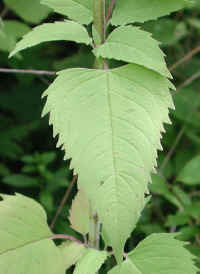 The leaves are used to make an aromatic mint tea. (Bergamot, Wild (Monarda fistulosa) - 19) This is a closer look at the structure of the wild bergamot leaves. (Bergamot, Wild (Monarda fistulosa) - 20) In this photo we can see the branching structure of the wild bergamot stems.